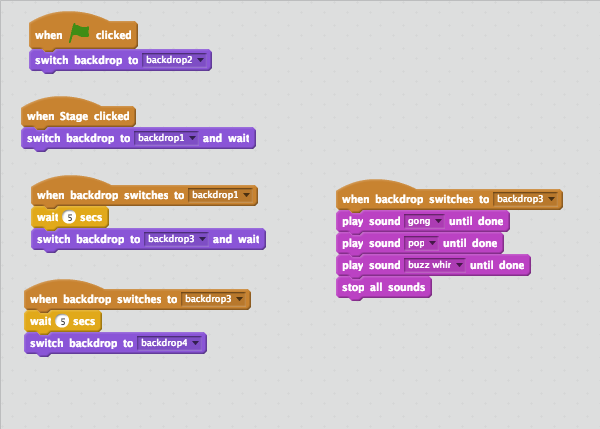 I learned more about coding and I figured out how to make things react with other things. I learned that things take time and that somethings don't come out the first time. I also learned how to use a Makey Makey. I learned how you shouldn't just give up, because in my project I wanted to quit but since I kept going, my game is done and I honestly like my game. I really enjoyed the Makey Makey and how it worked with everyday objects I would really like to use it a lot more in school, home or anywhere. I really liked how interacted with the computer. I loved the Makey Makey It was so much fun! I liked the idea of us figuring it go by ourselves. I enjoyed trying to solve the problem. Some people don't listen to the teachers when they explained the steps and sometimes people don't know what to do when the teacher not there. I enjoyed how we all had different ideas. I would say that I really liked the class. And that they did a really good job. The only thing I would suggest is that if a child really has no clue and asked others for help, then the teachers should help out . Other than that, I really liked it and I have no other suggestions. Click on the background to continue on with the story. Use AWSD to move and on the screen. With the big face use space. Thanks! 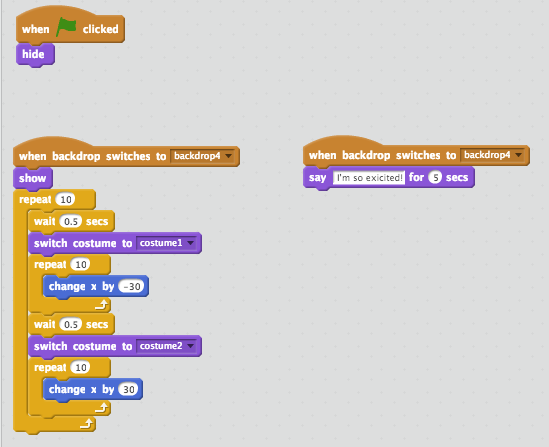 In scratch I've made a platform game about a little girl's named Joy. She was having a birthday party, but the cake ran away from her. The purpose of the game is to try to get the cake back. I have 9 backdrops most of them are in Joy's house. Her house is a light blue with a red roof and a wooden door. The room in the house that isn't blue is Joy's room. Joy's room is a light pink with a pink bed. The bed has four pillows and two of them are pink. She has glue on her bed and on the floor. The rest of the house is blue with a darker shades of blue more noticeable. Most of the backdrops are to describe the story. I have different levels in the game with a different backgrounds. I also have Joy and the character you move using, A, W, S, D keys. Joy is a little girl that has brown hair, a striped party hat and a purple dress and you are a white circle! I have it so that you can control it in different ways. You can click on it, use space bar and that you have to use A,W,S, and D.
In the end of the game someone caught the runaway cake with a net. And the people invited can finally enjoy the birthday party. I had a little difficulty with changing the background to fit the game. Every time I would try to change the background, it would stay the same. Eventually I figured out the problem and learned how to fix it. I used the wrong command. And I used the wrong events. After I fixed it, it was doing what I wanted to do. Today I played around with the background. I was able to make the background change and how it can make sounds. I also fit with the storyline of the game. Today I was able to change from the title screen to the playing screen. I also drew my backgrounds and characters. I made sure that it looked the way I wanted it to look. I drew the little character named Joy. I also came up with a story to the game. I learned how the character can move around, also I found new blocks. This helped my character move around. These are some of the codes I used. I really liked "The Impossible Game", because the idea is so easy yet they make it really hard. All you do is that jump but the creator makes the background go faster. I also liked the "Webcam Piano" because it interacted with you. It also was a piano you control with your hands. I would like to make a platform game. I like games with a storyline, plot and characters. Hi, my name is Ariadna and I like to play fighting games. I go to Chute and I'm going to the 7th grade. I went to the beach, mall and a bunch of other places during this summer.